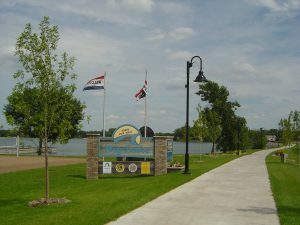 Big Lake, Minnesota is a rapidly growing community just beyond the metro suburbs. It’s geographical location is in a corridor placing it 30 minutes from St. Cloud and just 35 minutes from Minneapolis. Natural amenities such as lakes, the Mississippi and Elk Rivers, trail systems and parks make it a city and town for all seasons with outdoor activities from summer swimming in Big Lake to winter snowmobile races. A tremendous labor force and easy access to major roads make Big Lake the ideal place to live and work. Many residents find living in this country atmosphere inviting even though they may find themselves commuting into the cities to work, now made even more convenient with the launch of the Northstar Commuter Rail. This growing community has an industrial base to balance the rapid residential growth. You’ll find affordable start-up housing as well as move-up homes in the Big Lake community. Big Lake Town Hall is located at 21960 County Road 5, at Lions Park, 2.6 miles N. of Hwy. 10 on Eagle Lake Road. Big Lake Township is located in Sherburne County and has a total area of 43.8 square miles. The average value for a new home constructed in Big Lake Township in 2008 was $226,250. Big Lake Township added more people than any other township in the county during the last decade. The township offers urban living with a country atmosphere. It has an agricultural flavor with the north end having lakes and recreation areas. Click Here for the 2018 Winter Community Ed Catalog.